UNI-BEAVER seems like awsomely dangerful!! I love this new rebellious side of you, Nate. I hope I never get on your bad side. Whatchoo talkin' bout Sara Z? This site is now run by ME, Chester the Magical Centaur! So what you like is not Nate, it's the four-legged-blue guy right here! Where are all my comments? You don't like the Log-O-Nater!? It's pretty much the greatest thing that's ever been posted on this blog! Are you so blown away by its awesomeness that you cannot type? 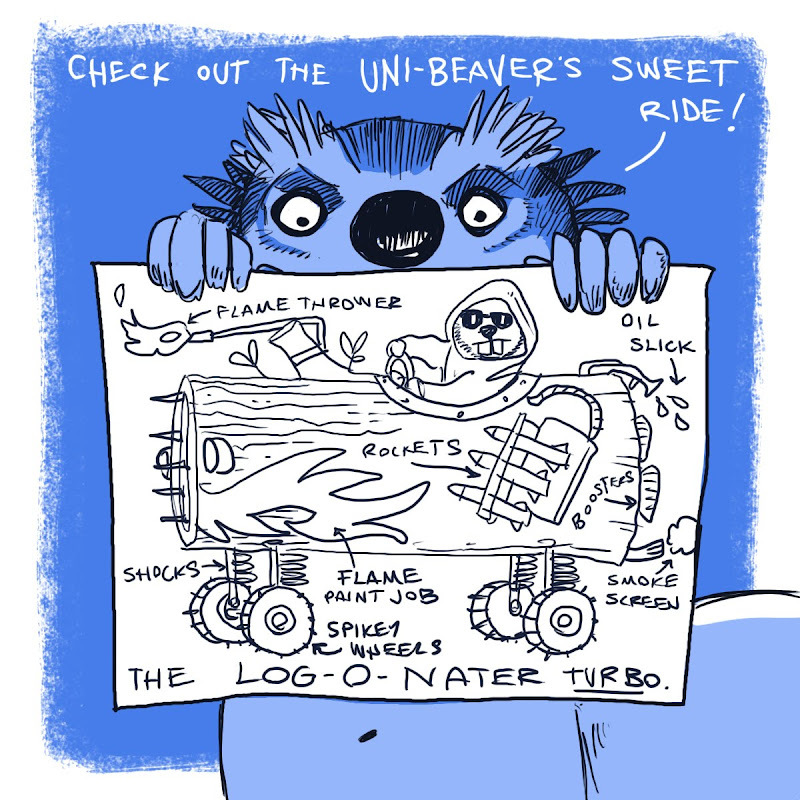 Sit back, and just bask in the total radness of the Uni-Beaver and his sweet, sweet log-based assault vehicle. Woops, I missed that first comment. Stuart, you are the official coolest commenter. May I put you on the Uni-Beaver's awesome fanclub mailing list? Wait--I just thought that through, better not. I imagine the NaNoWriMo Monster speaking with Strong Bad's voice. Isn't there a way to add audio to the blog? (This is Nate) Good grief! Laura, you must have a direct window to my brain--I was totally channeling Strongbad. Was it that obvious?